The direct image of GJ 758 B (circled as B) was taken with the Subaru Telescope's HiCIAO instrument in the near infrared. An unconfirmed companion planet or planet-like object, C, can be viewed above B.
Astronomerssay they have taken the first direct image of a planet-like object orbiting a starmuch like our own sun. A similarbreakthrough was announced last year, when astronomers unveileddirect images of a single-planet and multiple-planet system. However, thehost stars of such systems are stellar giants that are much more massive thanthe sun. The imagesof this newly identified object were taken in May and August during early testruns of a new planet-hunting instrument on the Hawaii-based Subaru Telescope. The objectcalled GJ 758 B orbits a parent star that is comparable in ?mass andtemperature to our own sun, said study team member Michael McElwain of Princeton University. The star lies 300 trillion miles (480 trillion km), or about 50light-years, from Earth. Scientistsaren't sure if the object is a large planet or a brown dwarf, a cosmic misfit alsoknown as a failedstar. They estimate its mass to be 10 to 40 times that of Jupiter. Objects above13 Jupiters (and below the mass needed to ignite nuclear reactions in stars) areconsidered to be brown dwarfs. Either way,McElwain says the image is exciting. "Browndwarf companions to solar-type stars are extremely rare," he toldSPACE.com. "It's exciting to find something that is so cool and so lowmass with a separation similar to our solar system around a nearby star." Theplanet-like object is currently at least 29 times as far from its star as theEarth is from the sun, or about the distance between the sun and Neptune. The factthat such a large planet-like object might be orbiting at this location defiestraditional thinking on how planets form, McElwain said. 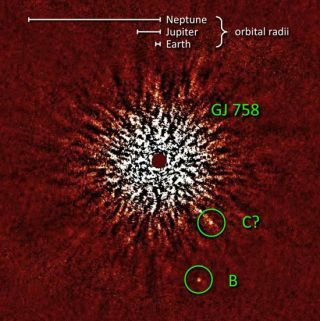 Astronomers think mostlarge planets form either closer to or farther away from stars, but not in thelocation where GJ 758 B is now. "Thischallenging but beautiful detection of a very low mass companion to a sun-likestar reminds us again how little we truly know about the census of gas giantplanets and brown dwarfs around nearby stars," said Alan Boss, anastronomer at the Carnegie Institution for Science in Washington, D.C., who wasnot involved in the research. "Observations like this will enabletheorists to begin to make sense of how this hitherto unseen population ofbodies was able to form and evolve." Theinstrument attached to the Subaru Telescope, called the High Contrast CoronagraphicImager with Adaptive Optics, is part of a new generation of instrumentsspecially made to detect faint objects near a bright star by masking its farmore intense light. Thescientists say telescope images have revealed a possible second companion tothe star, which they are calling GJ 758 C, though more observations are neededto confirm whether it is actually nearby or just looks that way. The studyteam included scientists from Princeton, the University of Hawaii, the University of Toronto, the Max Planck Institute for Astronomy in Heidelberg, Germany, and the National Astronomical Observatory of Japan in Tokyo. The results were releasedonline Nov. 18 in an electronic version of the Astrophysical Journal Letters.